This summer, as the Commonwealth countries prepare for the 2014 Games in Glasgow Scotland, Bermuda will be hosting games of a different origin. On Saturday 15th June at Saltus Playing Field in Pembroke, there will be a competition to see who can toss a long heavy wooden pole as accurately as possible, to see who can complete a 5K obstacle course in the shortest time and to determine which tug o’ war team is the strongest. In other words, the Caledonian Society of Bermuda is pleased to announce it will be holding its 2nd Annual Highland Games, which, in addition to a host of ‘field’ events will include Highland dancing competitions and bag piping demonstrations. Special guests at the games will be the Royal Canadian Mounted Police Pipe Band H Division and their Dancers. In addition we are delighted to welcome the Schiehallion Dancers from Hamilton, Ontario and the Mackenzie School of Dance from Halifax, Nova Scotia. The Caledonian Society of Bermuda in conjunction with the Bermuda Island Pipe Band and Highland Dancers will be hosting the event, supported by the Bermuda Regiment. Also taking part will be the North Village Band and the Somerset Brigade Band. From the feedback we received from the 1st games held last June, the organisers believe the Games, entertaining and highly colourful, will be well-received by residents and visitors alike. This is very much a family event, and there will be contests in which members of the public will be invited to participate. Among these will be the 50m dash for adults and children. The ‘kilted dash’, for runners wearing kilts, should prove particularly spectacular. So be sure to bring your running shoes with you. There will also be a great deal of activity to appeal to spectators. The Highland dancing competition will run throughout the day, punctuated by demonstrations put on by the highly skilled pipers and dancers from Bermuda and overseas. This event would not be possible without the support of our major sponsors. We would like to take this opportunity to thank the Bermuda Department of Tourism, Hiscox Bermuda, BELCO, Jardine Matheson and Goslings. Our host hotel is the Fairmont Hamilton Princess which is offering a great rate for any overseas visitors. Preceding the Games earlier in the week will be school visits by some of the pipe band and dance members, participation at the Beat Retreat on the Monday at Dockyard and Harbour Night on the Wednesday in Hamilton and a special performance by the RCMP Pipe Band at the Fairmont Hamilton Friday Happy Hour followed by a traditional scottish Ceilidh. Caledonian Society of Bermuda President, Scott Devine said, “As president of the Caledonian Society I’m delighted to announce the 2nd Bermuda Highland Games. The society has worked long and hard to promote all things Scottish in Bermuda and the Highland Games is the ultimate Scottish event. 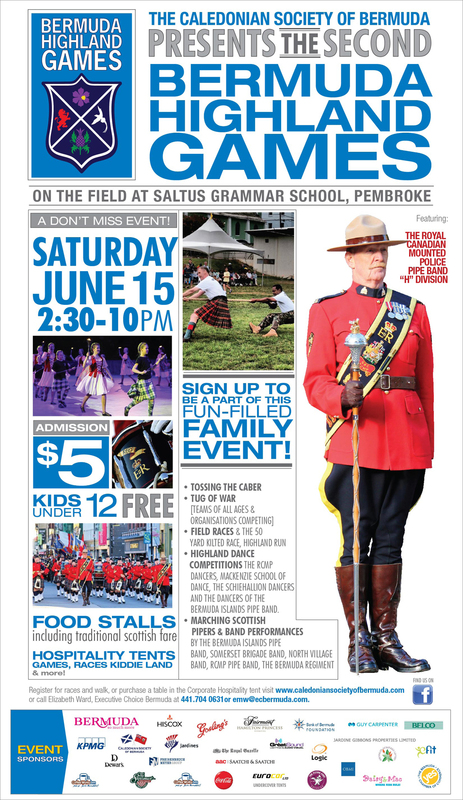 We look forward to welcoming the entire island to Saltus Field to sample traditional Scottish food and games, like tossing the caber, tug o’ war, musical displays and highland dancing competitions. The whole event will run alongside the visit to the island of the RCMP H Division who will also be accompanying the Bermuda Regiment in the Queen’s Birthday Parade which will be held earlier that day. The day is shaping up to be a great spectacle and lots of fun for the entire family. We hope people will come out and enjoy a great day of fun, games and all things Scottish”. Food and drink, with a distinctly Scottish influence, will be available for purchase at a number of different food stalls, with a ‘kiddie land’ for younger members of the family. With an admission price of $5 per adult and children under 12 years free, this will be an inexpensive way for families to enjoy healthy exercise and build a sense of community. Events begin at 2.30pm with a spectacular Parade from City Hall to Saltus Field and will continue into the evening, with closing ceremonies planned to start at 8.30pm which will include a display by the Schiehallion Dancers then a march past by the participating bands.